Rheumatoid Nodules: Are Rheumatoid Nodules Dangerous? A variety of symptoms can occur when suffering from rheumatoid arthritis. The sporadic, yet chronic nature of the disease is such that symptoms may come and go over time and manifest in different ways. One of the most common skin-based symptoms of rheumatoid arthritis is the development of nodules. These rheumatoid nodules occur in about one-quarter of rheumatoid arthritis patients, both men and women and their severity can vary from patient to patient. Although nodules are generally not dangerous or debilitating, there are treatment options available if it becomes necessary to have them reduced or removed. What are Rheumatoid Arthritis Nodules? Rheumatoid nodules are firm, noticeable lumps that form underneath the skin of some rheumatoid arthritis patients. They generally form on or near the base of the arthritic joints. Less commonly, nodules may form in the eyes, lungs and vocal cords but these represent severe cases. Furthermore, rheumatoid nodules can vary in size and shape. Most nodules have a circular shape, however, some can be linear in shape as well. Also, they can range from small and pea-sized to as large as a walnut. When rheumatoid nodules form a cluster of tiny nodules, they are referred to as micro-nodules. 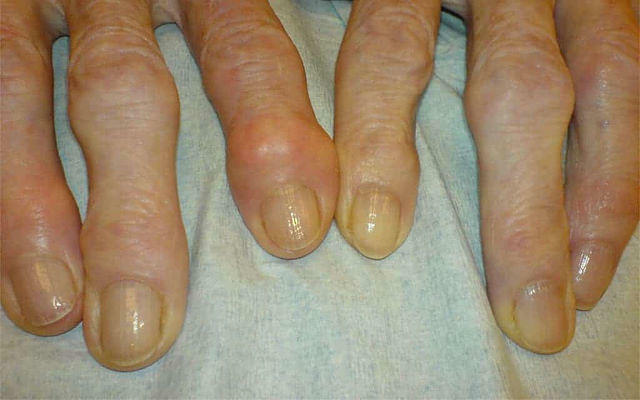 This severe, less common case of micro-nodules generally occurs around the arthritic finger joints. Though nodules are firm or even doughy to the touch and don’t cause any feelings of tenderness, they can occasionally be painful. Pain typically occurs when flare-ups are active and the joints become inflamed such that it impacts the nodules and the area around them. Rheumatoid nodules are capable of moving around but some form a connection with the tendons or tissue beneath the skin and become fixed. Currently, research doesn’t clearly indicate a specific cause of rheumatoid nodules and why exactly they develop in some patients and not in others. Given that they generally form on extensor joints, rheumatoid nodules could be the result of repeated pressure on the affected joints over time. Some patients even report a decrease in size or disappearance over time. Patients who are bedridden, sometimes form rheumatoid nodules on the backs of their elbows, legs, hips and sacrum. There are even reported cases of these nodules on the posterior scalp. These are all the pressure points of bedridden patients and possibly the catalyst to the formation of rheumatoid nodules. Are Rheumatoid Nodules a Health Concern? For the most part, rheumatoid nodules do not cause severe pain for most patients and are not usually a health concern. However, on rare occasions, the skin over top of the nodule can become infected or ulcerated and this only occurs if an excessive amount of pressure is placed on the nodule. If nodules develop in sensitive areas, then increased pressure resulting in infection would be more likely to occur. Rheumatoid nodules have also been known to form in areas of the body other than the joints. One location where nodules develop, leading to severe symptoms, are the eyes. The autoimmune process in rheumatoid arthritis causes inflammation, eye dryness, and pain. Though it is rare, rheumatoid nodules are capable of forming on the vocal cords and also in the lungs, heart and other internal organs. Because of this involvement of multiple organs, diagnosis can be challenging. Symptoms are not always obvious and sometimes mimic other illnesses. Most commonly, rheumatoid nodules develop in patients already living with rheumatoid arthritis for some time. They generally don’t precede other rheumatoid arthritis symptoms. Research suggests that rheumatoid nodules are commonly found in patients who possess high levels of the protein rheumatoid factor, an antibody seen in a handful of autoimmune disorders. This may mean that the patients may require treatment with drugs in the class of immunomodulators, such as Methotrexate. Similarly, research has also shown an increased likelihood of developing nodules in rheumatoid arthritis patients who smoke, even though a direct link between smoking and the formation of rheumatoid nodules is still unclear. Accelerated nodulosis is a specific condition that occurs with rheumatoid nodules where patients experience the formation of multiple nodules in a centralized location typically on the fingers and backs of the hands. This is compared to the sporadic appearance of a few rheumatoid nodules that form in patients here and there. In many cases, physicians have found that accelerated rheumatoid nodulosis occurs in patients who are pursuing methotrexate therapy. Specific treatment for rheumatoid nodules isn’t generally advised. This is because most nodules are only unsightly as opposed to debilitating, and therefore are not aggressively treated. However, if nodules cause the skin to become infected or ulcerated, then treatment will be necessary. Nodules that form on the heels or beneath the feet can be debilitating to the patient limiting their mobility. In these cases, treatment would not just be advised but likely necessary. Certain disease-modifying antirheumatic drugs (DMARDs) have been known to reduce the appearance of rheumatoid nodules. Other treatments like steroid injections can also help to decrease the size of rheumatoid nodules. Some patients report that even after treatment or having their rheumatoid nodules removed, they do grow back. Unfortunately, the nature of rheumatoid arthritis and its symptoms mean that the nodules can recur after treatment. With this in mind, it is important to have a discussion with your physician about your symptoms, and the available treatment options that can help reduce the size of rheumatoid nodules or even remove them.